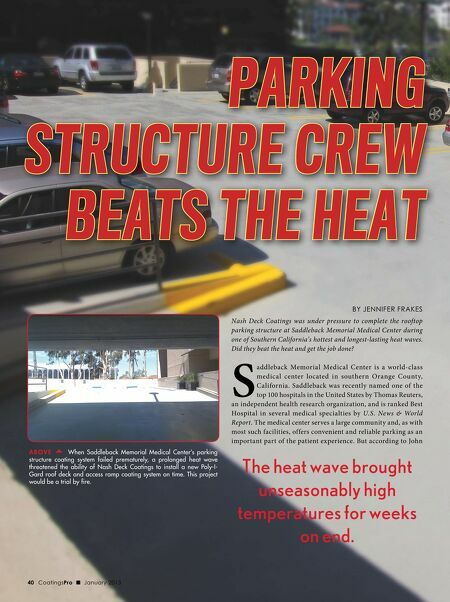 Parking Structure crew BeatS the heat By Jennifer frakes Nash Deck Coatings was under pressure to complete the rooftop parking structure at Saddleback Memorial Medical Center during one of Southern California's hottest and longest-lasting heat waves. Did they beat the heat and get the job done? S addleback Memorial Medical Center is a world-class medical center located in southern Orange County, California. Saddleback was recently named one of the top 100 hospitals in the United States by Thomas Reuters, an independent health research organization, and is ranked Best Hospital in several medical specialties by U.S. News & World Report. The medical center serves a large community and, as with most such facilities, offers convenient and reliable parking as an important part of the patient experience. 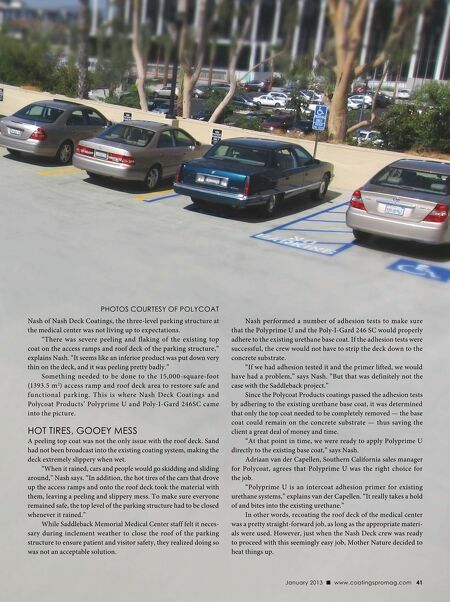 But according to John 5 above When Saddleback Memorial Medical Center's parking structure coating system failed prematurely, a prolonged heat wave threatened the ability of Nash Deck Coatings to install a new Poly-IGard roof deck and access ramp coating system on time. This project would be a trial by fire. 40 CoatingsPro g January 2013 The heat wave brought unseasonably high temperatures for weeks on end.